Hays witnessed many changes in Council Grove over his 25 years as a community leader: the Kanza/Kaw Indians were relocated to their reservation in this area; the settlement he started grew into a town, and Kansas evolved into a territory, and then achieved statehood. Hays lived in this home until his death in 1874. This is one of just a few trail homes in the area that has been preserved near its original condition. Today, the home is operated as a museum by the Morris County Historical Society. There is a historical marker on the property. It is located on Wood Street near Hall Street (two blocks south of Main Street). Other historic properties that once belonged to Seth Hays are the Historic Barn east of Council Grove and the Hays House Restaurant on Main Street. 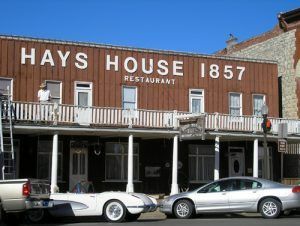 The Hays House Restaurant, located at 112 West Main, was built by Seth M. Hays, a grandson of Daniel Boone and cousin of Kit Carson, who came to Council Grove in 1847 to trade with the Kanza Indians. He originally built a log house here, out of which he traded with the Indians, who purchased guns, blankets, flour, and tinware from him. In 1857, he put up the large building originally called the Frame Store. The store then served citizens a trading post, restaurant, hotel, courthouse, post office, printing office, meeting and social hall, and an early, bawdier form of dinner theater. In October 1858, the first term of court was held in Morris County in Hays’ Frame Store. The jury deliberated upon their verdict under the shade of a tree that stood in the yard. Business was lively: in a four day period in 1860, the Kaw Indians spent $15,000 here and across the street at the Conn Store. The Santa Fe trade became increasingly lucrative. In 1863, Hays’ former partner, G.M. Simcock, estimated that $40 million in freight was hauled in ox-and mule-drawn wagons through the town. In addition to supplies, the Hays House offered meals and rooms to weary traders on their eight-week trip between New Mexico and Missouri. Early patrons included Jesse James and General George Armstrong Custer. It was later remodeled as the Hays House Restaurant and today, is famous as the oldest continuously operated restaurant west of the Mississippi River. Its interior provides a look at many historical artifacts, including artwork, arrowheads, other American Indian relics, and a notable crystal collection. There is an outdoor exhibit in front of the building. Built in 1858 by local merchant Malcolm Conn, the Conn Store was one of the two most important trading posts in Council Grove during the Santa Fe Trail era. It first catered to the Kanza/Kaw Indians and Santa Fe Trail travelers, and later to local settlers. 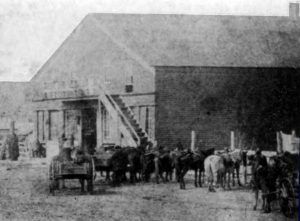 One of the oldest buildings still standing in Council Grove, the Conn Store provided accommodations, meals, and stables for freighters, in addition to retail operations. 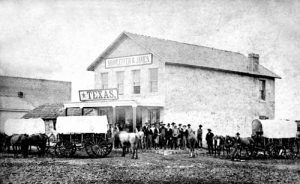 Rivaling the outfitting firm already run by Seth Hays on the opposite side of the street, business was brisk, so much so, that in 1864, Conn sold $24,000 in merchandise in a single month. The Conn Store has been added on to and remodeled over the years. The outline of the original store is defined by the light-colored stone on the building’s west side. Today, the building, which is listed on the National Register of Historic Places, is utilized by a local business. It is located at 131 W. Main St. An outdoor exhibit is located across the street. In 1860, Council Grove merchant Goodson M. Simcock constructed the southwest portion of this 2-story stone house. Simcock was a partner of Seth Hays, providing goods and services for the Kaw Indians and the Santa Fe Trail trade. He was one of the organizers and original stockholders of the Council Grove Town Company, formed in 1857. Upon Hays’ retirement in 1862, Simcock became the sole owner of the business for the next 11 years, retiring in 1873. The “Simcock House” was added on to in 1863 and in the early 1900s. The house, which is on the National Register of Historic Places, is located at 206 W. Columbia St. The building is a private residence and not open to the public. This land was once part of Kaw and Osage Indian homelands. In the early 1800s, the Kaws‘ domain extended well beyond the present-day borders of Kansas. 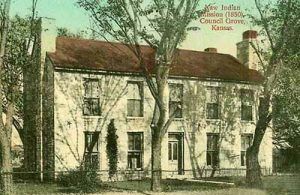 In 1846, the federal government forced the Kaw people onto a 20 square-mile reservation surrounding Council Grove. About 1,000 people, struggling with disease and starvation, lived in three nearby villages. 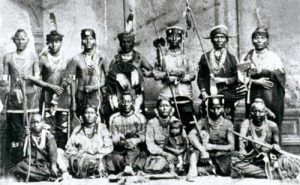 The Kaw lived on the reservation for less than 30 years when, despite an impassioned plea to Congress by Chief Allegawaho in 1873, the US government relocated 600 Kaw Indians to Indian Territory (present-day Oklahoma). In 1850, workers from the Shawnee Methodist Mission near Kansas City traveled 110 miles on the Santa Fe Trail to build the Kaw Mission and boarding school for Indian boys. The mission opened in 1851, with funding from the US government. For three years, 30 Kaw boys called this building home and school. Mission schools were part of the effort to assimilate Native Americans into white culture and toward Christianity. However, the government reported that the operational costs were too high, and the school and mission closed in 1854. It then became a school for white children, becoming the first all-white school in Kansas. 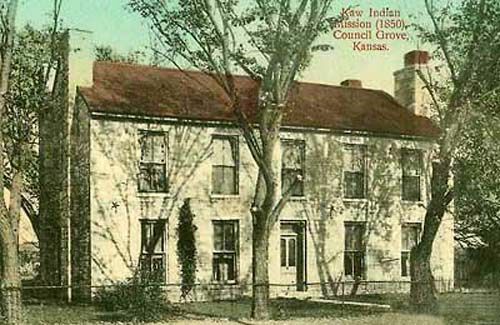 Today, the Kaw Mission, located is one of the oldest buildings still standing in this part of Kansas and is operated by the Kansas State Historical Society as a museum. Kanza/Kaw Indians who gave the State of Kansas its name, the headquarters for the Kaw Nation is now in Oklahoma, where the tribe was removed to in 1873. 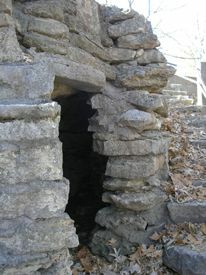 Hermits Cave located on Belfry St. near Hays St. (2 blocks north of Main Street) was the temporary abode of an Italian religious mystic, Giovanni Maria Augustini, Born in 1801, this religious mystic lived here for a brief period in the spring of 1863. Born in 1801 in Novara, Italy, he was the son of a nobleman and received a fine education in preparation for the priesthood, but, was reportedly forced to leave Italy after falling in love with a young lady. He came to America and wandered from one Indian tribe to another teaching the gospel and administering the last sacrament to people on the Santa Fe Trail. In Council Grove, he was known as Father Francesco.